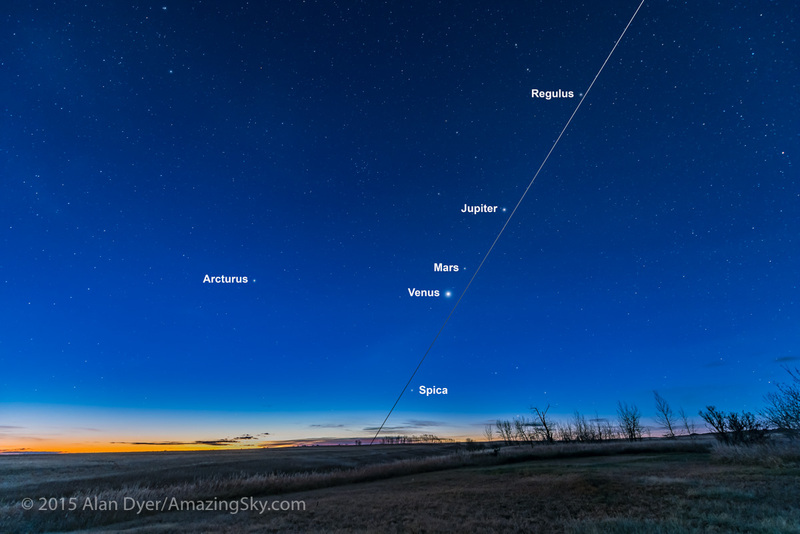 Four planets appear in the dawn sky outlining the morning ecliptic. 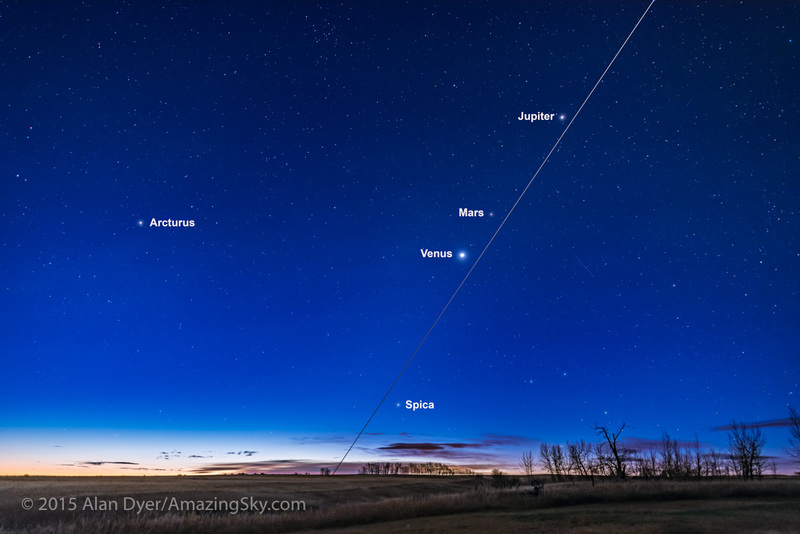 This morning, October 20, I was able to capture four planets in the morning sky, arrayed along the ecliptic. From bottom to top they are: Mercury (just past its point of greatest elongation from the Sun), dim Mars, bright Jupiter, and very bright Venus (just 6 days away from its point of greatest elongation from the Sun). Above Venus is Regulus, in Leo. I’ve added in the labels and the line of the ecliptic, rising steeply out of the east in the autumn dawn sky. Of course, there is a fifth unlabelled planet in the scene, quite close in the foreground. The image below is an unlabeled version. Mercury will be disappearing from view very quickly now as it drops back down toward the Sun. 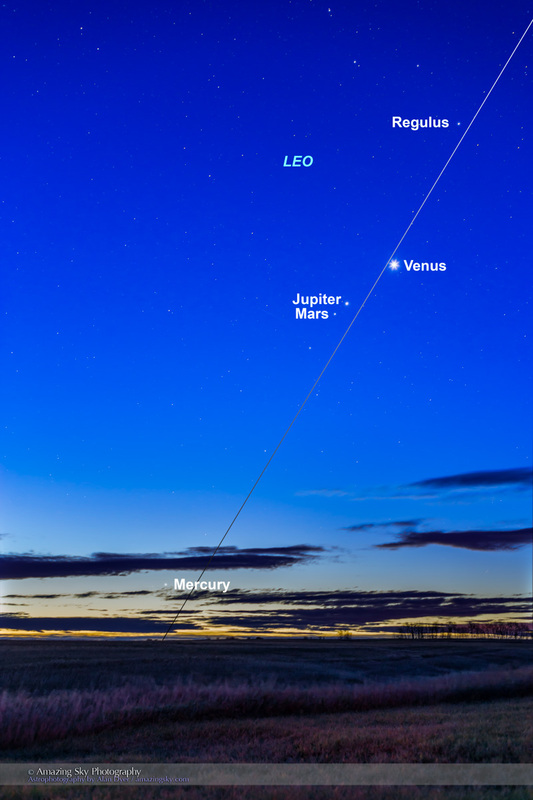 But over the next week the three higher planets will converge into a tight triangle just 4.5 degrees apart. We won’t see these three planets this close together in a darkened sky until November 2111. 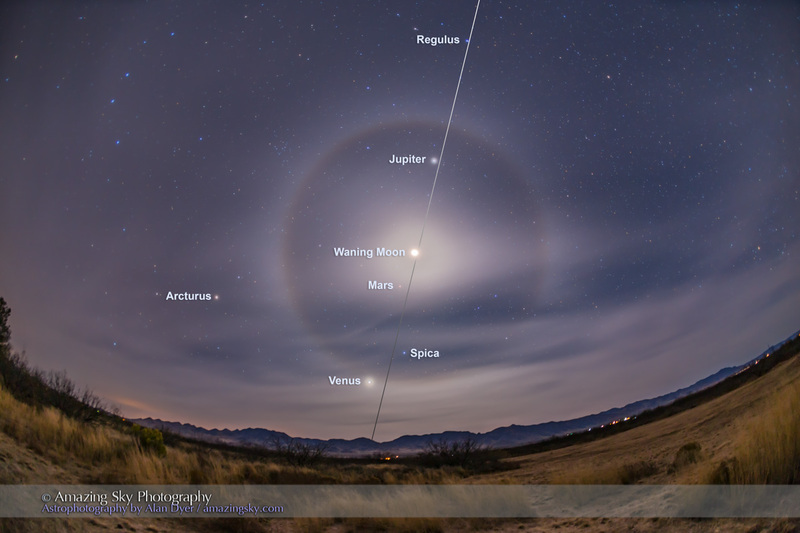 For more information on this week’s dawn sky planet dance see my previous blog entry. 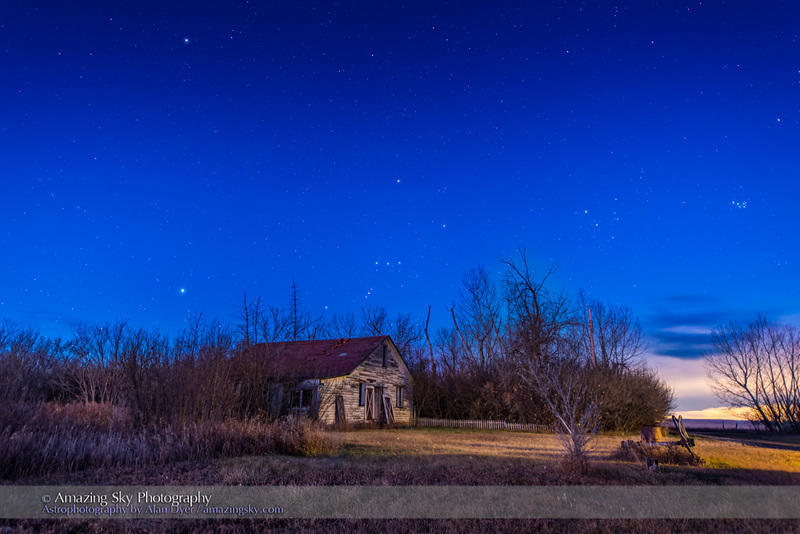 I shot the scene from home in southern Alberta. 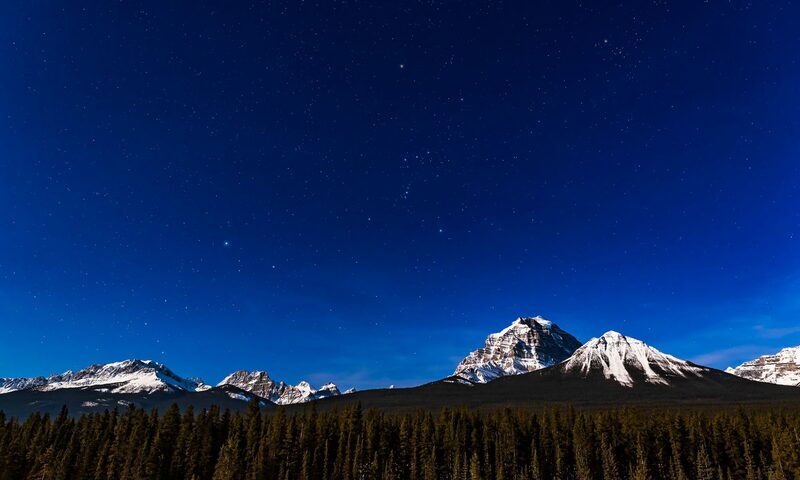 The image is a composite stack, with manually created masks (not an HDR stack), of 5 exposures, from 15 seconds to 1 second, to contain the range of brightness from the bright horizon to the dimmer star-filled sky higher up. All are with the 35mm lens and Canon 6D at ISO 800. Heads Up! – Comets, Planets, and Zodiacal Light, Oh My! As the Moon departs the evening sky, we are left with a dark sky for viewing Comet Lovejoy, converging planets, and the elusive Zodiacal Light. The western sky contains wonders this month. 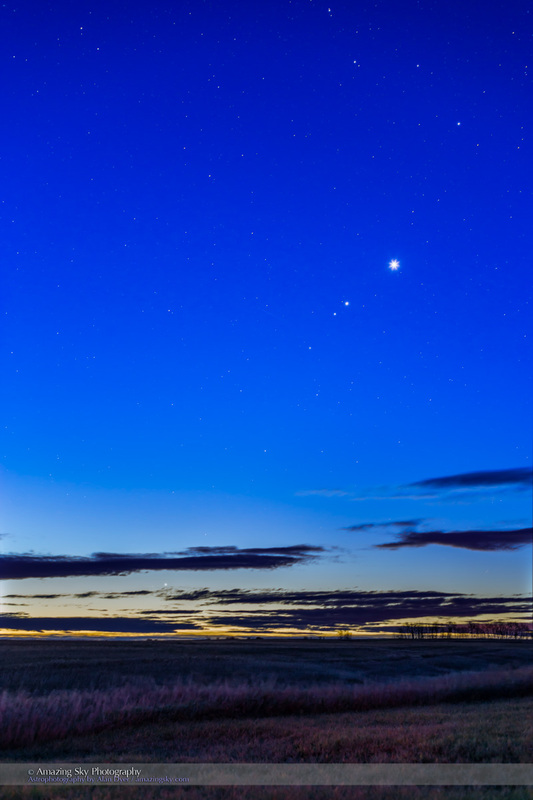 Look into the evening twilight and you’ll see brilliant Venus appearing a little higher each night. As it climbs up, fainter Mars above is descending closer to the horizon. The two planets are converging toward a spectacular close conjunction with each other, and with the waxing crescent Moon, on February 20. Meanwhile, Comet Lovejoy (C/2014 Q2) continues to perform well. It is now in the northwestern sky in the early evening, as it travels up through Andromeda into Cassiopeia. While technically visible to the unaided eye, you really need binoculars or any telescope to see Comet Lovejoy well. Through optical aid it does show a faint tail. But it takes a long exposure photo to show it well. 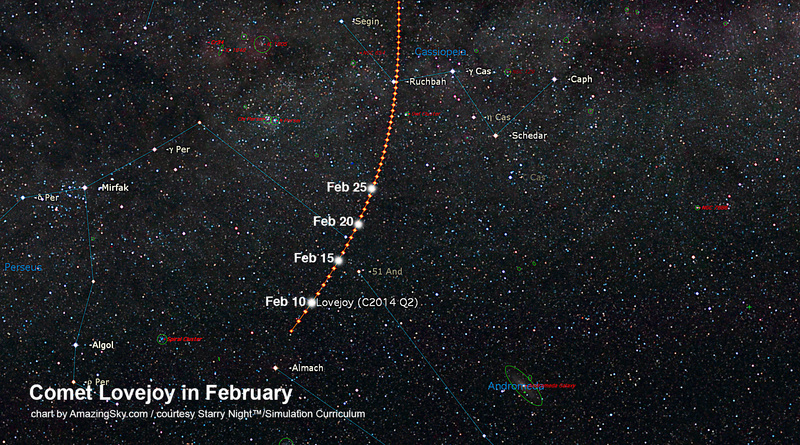 Here’s where to find Comet Lovejoy over the next couple of weeks, during the current dark-of-the-Moon period. Look for a fuzzy star in Andromeda. It’s not passing very near any notable deep-sky objects, but its position will still make for a nice wide-angle photo with the comet embedded in this photogenic region of the northern autumn sky. 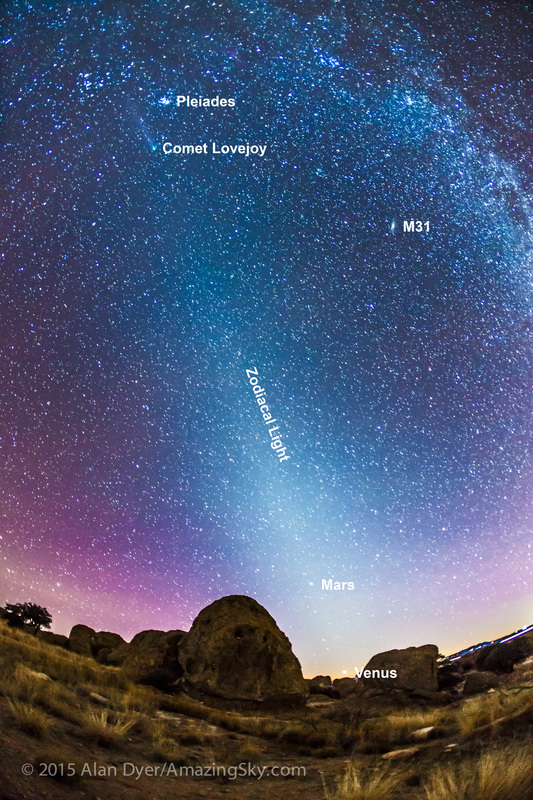 The other sight to look for each evening for the next two weeks is the Zodiacal Light. My photo shows it from last month, when Comet Lovejoy was crossing the ecliptic. Look for a pyramid of light stretching up from the sunset point to high in the west. It follows the ecliptic, the green line in the top star chart. It takes a dark sky to see it, and it helps to be at a southerly latitude. But I’ve seen and shot the Zodiacal Light nicely in February from home in Alberta at 51° latitude. The Zodiacal Light is caused by sunlight reflecting off cometary dust in the inner solar system. To see it, wait for most of the evening twilight to fade away. 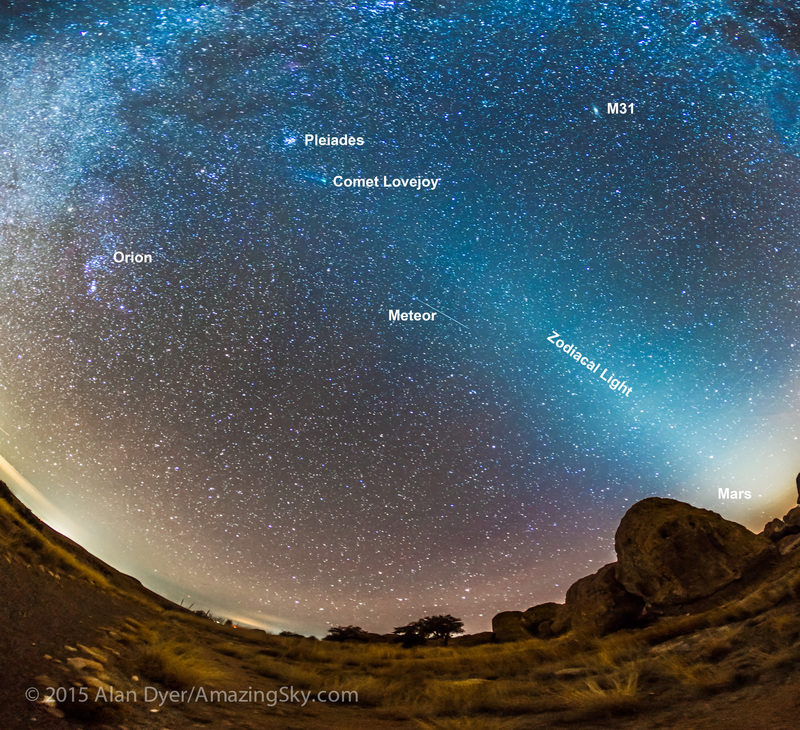 The glow that’s left brightening the western sky is the Zodiacal Light. 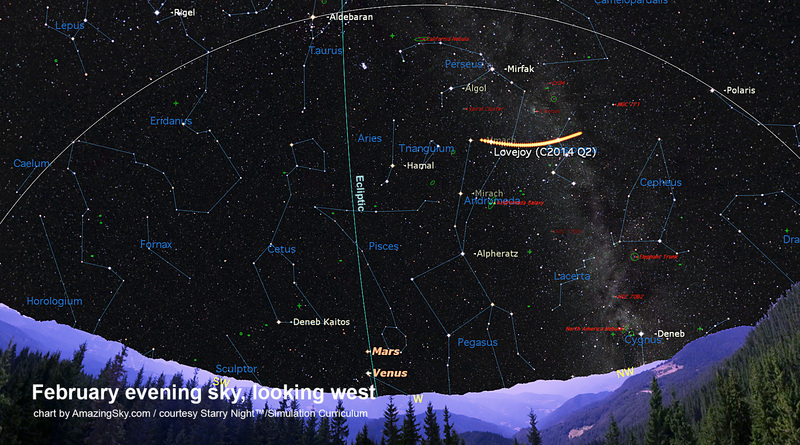 There’s lots to see just in the western evening sky during the next two weeks. Clear skies! What a beautifully photogenic comet Lovejoy is proving to be! On Friday, January 16, I caught Comet Lovejoy crossing the ecliptic as it travels through Taurus. 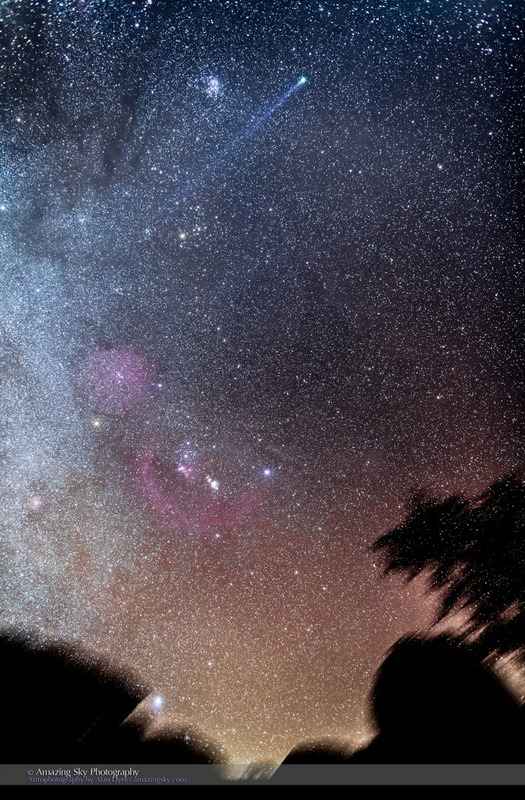 The long exposure above shows it amid the star clusters, nebulas, and dark clouds of Taurus and Perseus. The blue Pleiades is at centre, and the red California Nebula is at top. Throughout are the dark tendrils of the dusty Taurus Dark Clouds. The long blue ion tail of Lovejoy now extends back 15° to 20° on photos and is easy to trace for half that distance in binoculars in a dark sky. However, this wide-angle nightscape shows the real orientation of the comet, high in the sky above Orion, here rising over the rock formations of City of Rocks State Park, my favourite dark sky site in this area of New Mexico. Taken earlier in the evening, this ultra-wide image shows the comet at top, with its blue tail oriented along the ecliptic and aligned with the Zodiacal Light, from the glow of sunlight reflecting off comet dust in the inner solar system. The Zodiacal Light follows the ecliptic, the plane of the solar system and where we find the planets, such as Mars and Venus at bottom here. The comet seems to point toward the Sun, now below the horizon here at the base of the Zodiacal Light. That’s just as it should be! 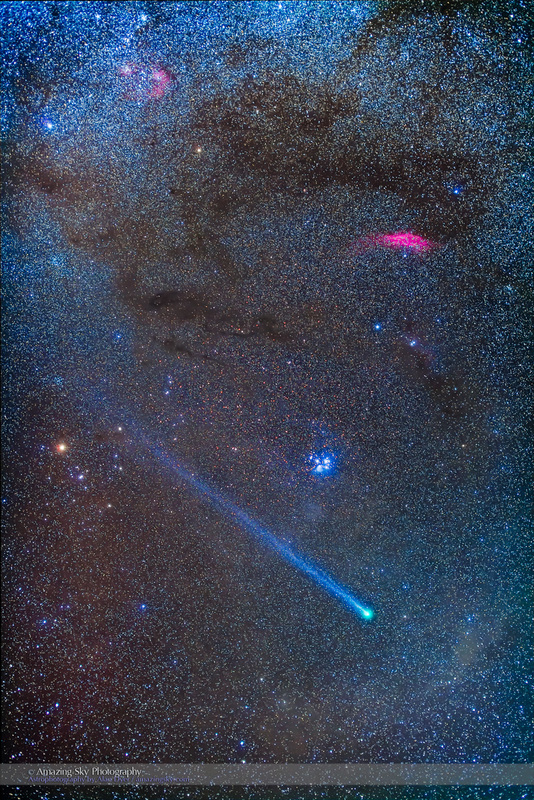 Comet gas tails always point away from the Sun, as they are blown away from the comet’s head by the solar wind. This night Comet Lovejoy was crossing the ecliptic, as its orbit continues to take it north in a path almost perpendicular to the ecliptic. While planets orbit in the ecliptic plane, most comets do not. They can have orbits oriented at all kinds of angles off the ecliptic plane. But on January 16 Comet Lovejoy crossed the ecliptic, placing it at the apex of the Zodiacal Light. This wider view takes in the Zodiacal Light, the comet and Orion rising at left.